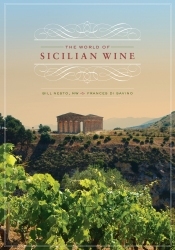 This is a review of The World of Sicilian Wine, by Bill Nesto and Frances Di Savino. Hardback is available in the UK for just under £20. The visual appearance of this book is not great. It has no pretty pictures, and is certainly not a coffee table book. That does not overly bother me, but I also found that its design did not lend itself to orienting myself in the book – I am not sure why, but a design professional might be able to figure out and correct the problem. Also the maps are basic, and frankly inadequate as so many aspects of wine depend on geography. I have vowed to reread the book with good maps to hand, so I can get a better understanding of the text. However, the fact that I want to reread, hints at its strong point – the written content. It very comprehensively and authoritatively covers the subject of Sicilian wine – history, geography, grape varieties, viticulture, enology, and the individual producers and their wines. For Sicilian wine this book has no equal, and it covers the ground a lot more thoroughly than most books do for other regions. Stylistically it is a bit uneven. Most of the book reads very well, but there are chapters where the language is a bit clunky. I suspect that is partly due to it having two authors, and partly perhaps the result of deadline pressure reducing the time available for editing. But don’t let any clunkiness, or lack of maps, put you off. Obviously this book will only appeal if you have a serious interest in the wines of Sicily, but if you do you really need this book. This entry was posted in General and tagged book, italy, sicily. Bookmark the permalink.